With Earth Day right around the corner, it’s a perfect time to ask ourselves if we’re doing enough to help the planet. While it might be difficult at times to discover new ways to be environmentally friendly while on a budget, doing so could actually save you a decent amount of money. So to help incentivize some of you to be a little greener, here are some great ways to keep the planet healthy and your wallet full. This may not be something you do on the regular, but recycling your aluminum cans, plastic bottles and glass at a bottle return center could net you some extra cash. Although the return isn’t huge, taking a trip every month or so to the recycling machine is an easy way to make a little extra cash. Just think of it as, you’re going to the store to buy food anyway so returning the bottles isn’t an extra trip but one that actually gives you money back. Keep in mind you paid for the bottle deposit so you’re wasting money by not returning the bottles. Not only that, but you’ll also be cutting down on pollution caused by waste. A great way to spend that little extra windfall each month is to put the money towards your grocery budget (but don’t make this an excuse to go over budget). Maybe they look a little funky on your roof like you’re looking for aliens, but your wallet will love how much they help you save. Many companies will now install the panels free of charge, though make sure you read through the contract and make sure you understand what you’re giving up to get the panels. You can then sit back and let Mother Nature help you rack in the savings as you use less and less paid electricity and more of the sun’s natural, and free, energy. The savings don’t have to stop there though. Take the money you’ve saved and look into investing in some other energy-conscious products for your home. Energy Star appliances, LED lightbulbs, and low-flow sink fixtures are just a couple of examples of things that can keep both your wallet and the environment a little bit cleaner. The savings you see on your utility bills can be placed toward savings for future home improvement projects and sometimes, if you have a lot of extra energy you can sell that back to the energy company. Green cleaning products are all the rage, but they can come with a bigger price tag than normal cleaning products. The good thing is, they are so simple to make yourself at home and you most likely already have all the ingredients in your kitchen. Better yet, making these products at home can help cut down on the environmental pollution caused by their manufacture and disposal. Eartheasy.com has some great examples of non-toxic home-cleaning formulas. Just take a moment to add up cleaning supplies each month and see your savings from making it yourself. Wouldn’t it be nice to not have to deal with traffic or gas prices? Public transportation and carpooling is a great way to save some money and reduce your carbon footprint. The savings don’t just end with gas though. Fewer miles on your car will save you money on maintenance and repairs, and ditching a vehicle altogether (if you can manage it) will keep you from having to pay money on car insurance and registration fees. With all that extra money, you can start saving up for an emergency fund or bolster the savings you already have. Of course, if you think you might need a car again someday in the future, you can put a little portion of that money towards the down payment on a new car or lease. Also, consider an alternative earth-friendly car to cut costs on gas and even service for that car. You should always take the future and the unexpected into consideration when planning your savings. Also, if you have debt, the extra savings can be added to your monthly payments to pay down your debts faster. Your debt load can have an impact on your credit scores, which in turn have an impact on your access to credit in the future. The better your credit, the better chances you have of getting lower interest rates, which saves you money over the lifetime of the loans. You can see how your debts are affecting your credit by getting your free credit report summary on Credit.com. So take some time this Earth Day and see if there is anything you can do to help the environment. Chances are, doing so could actually save you, or make you, a decent amount of money in the long run. In addition to saving money, your actions can help make this planet a healthier, safer place to live for all of us. This article by Leslie Tayne was distributed by the Personal Finance Syndication Network. If you have old unpaid debts, it can be helpful to know the statute of limitation that applies to those debts. If the statute of limitation (SOL) has expired, a debt is said to be “time-barred,” and a creditor or debt collector is not supposed to sue you to collect. Here are the seven most common questions we’ve received from readers about this topic. 1. How long is the statute of limitation for my debt? The time period typically either starts when you fall behind on a debt, or from the date of your last payment, and the length of time depends on state law for that type of debt. This chart is a guide to state statutes of limitation. Unfortunately, it is not always clear-cut. So it’s a good idea to check with your state attorney general’s office, a consumer law attorney or legal aid, especially if you are being threatened with legal action. 2. Can a debt collector try to collect after the SOL has expired? In many cases, yes. However if you tell the debt collector not to contact you again, they must stop. It’s a good idea to put your request in writing. Once they’ve received it, they can contact you only to confirm that they have received your request or to notify you of legal action they are taking to collect. In some states, however, trying to collect a time-barred debt is illegal and a creditor who attempts to do so is breaking the law. 3. If the SOL has expired can I still be sued? It is not uncommon at all for consumers to be sued for time-barred debts. If you are sued for an old debt and the statute of limitation has expired, you can raise the expired statute of limitation as a defense against the lawsuit (here are some other debt collection defenses you can use, too). However, many consumers do not appear in court and therefore the creditor or collector gets a judgment against them. That is why you should not ignore a legal notice about a debt, even if you think the debt is too old. A consumer law attorney or bankruptcy attorney can help you figure out how to respond. 4. Should I pay an old debt? That’s something only you can decide. However, keep in mind that if you pay anything — even a small amount — on an old debt, you may restart the statute of limitation. That’s why it can be risky to pay an old debt if you can’t afford to pay it in full. You could open yourself up to collection efforts, or even a lawsuit, for the entire amount the collector says you owe. 5. Can a debt still appear on my credit reports after the SOL has expired? In many cases, the answer is yes. The length of time that negative information may be reported is governed by the federal Fair Credit Reporting Act. Most negative information can be reported for seven years. The statutes of limitation for most consumer debts, on the other hand, is four to six years. So you could have a situation, for example, where the statute of limitation expired on a debt in four years but the related collection account still appears on your credit reports for another three years after that. Collection accounts can do serious damage to your credit scores. You can get a free credit report summary on Credit.com to see if an old debt is affecting you. 6. I took out a debt in one state but then moved. Which state’s SOL applies? That can be a difficult question to answer. Consumers can generally be sued in the state where they took out the loan or the state where they currently live. Sometimes the statute of limitation will be based on the laws of the state described in the contract (in the case of credit cards, that will be spelled out in the credit card agreement). When it’s not clear which state’s SOL applies, it is often up to the court to decide. In a number of court cases, the statute of limitation that was shortest was applied. But that’s not true in all cases. That’s why it is helpful, if you are being sued for a debt, to consult with a consumer law attorney who can help you understand whether the statute of limitation has likely expired. 7. What is the SOL for court judgments? If a creditor or collector has obtained a court judgment there is often a separate statute of limitation that applies to judgments. (Tip: If you have unresolved debts, be sure to at least get your free annual credit reports to see if any judgments are listed.) In many states, that time period is 10 years or longer, and judgments may be renewed. Learn more about how about judgments work here. We all get emotional – it’s human nature. The trouble sometimes comes when our emotional side overrules our rational side for money matters. Check out some of the common ways emotions can hurt your finances, discover if you are an emotional spender and how to combat the problem. It is easy to become bitter when we see other people (whether they are friends, family members, co-workers, old classmates, neighbors or even celebrities) make big purchases. Between Facebook, Twitter, Instagram, Snapchat and all of our social media options, it’s all too easy to compare our life to others. But trying to “keep up with the Joneses” can lead you to sabotage your own financial goals. Instead of focusing on the jealousy or being embarrassed by your own means, try to use their success as a motivator. Think about what you have to be thankful for, evaluate your own finances, make a plan to forgo some expenses and save for what you really crave – whether that’s buying a home or paying off student loans. If you are shocked when you check your bank account balance or get your credit card bill at the end of the month, you probably are not following a budget very well. You may look in your closet and find that you suddenly have a lot more clothes or shoes or have vague memories of eating out at fancy restaurants. It can be a good idea to pinpoint your triggers, start to weigh every financial decision carefully and track your spending. It is easy to put things off for the future, but at some point that future comes around. If you tend to avoid responsibility for and procrastinate on activities like saving money, your future self may suffer. For example, your retirement can be in serious danger. If you don’t trust yourself to be proactive about putting money away, try to find ways to make it easier. It can be a good idea to set up automatic deposit to send some funds straight from your paycheck to savings, emergency or retirement accounts. The same is true with your credit. The costliest mistake home shoppers, car buyers and credit card users make is not knowing where their credit stands before they apply. That mistake can add up to tens of thousands of dollars over your lifetime since interest rates are heavily dependent on your credit scores. Doing work and rebuilding your credit well in advance of applying for loans can make sure you get the best deal possible. You can check your credit scores for free on Credit.com to see where you stand. Sometimes when you come into a windfall or are making more money than friends and family members, you feel uncomfortable and think you need to share the wealth. This can lead to picking up the tab at dinner, for vacations or for other expenses. That money advantage can quickly disappear. To avoid this, it can be important to make a new financial plan and budget immediately. Then you can set up a section in your budget for spending that allows you to be generous with family and friends. You can also do things like invite friends to dinner in your home or choose a less expensive restaurant to visit. Q: I’m buying a home and the seller has offered to personally give me a mortgage instead of me going through a bank. My credit is fine so it’s not like I need the help from the guy. I think he sees it as income to him on the interest payments. What are the positives and negatives of a deal like this? A: There can be benefits to taking a mortgage from the seller, but this kind of deal isn’t without downsides, too. With a direct loan from the home’s seller, your closing could be faster than with a traditional lender, said Alan Meckler, a certified financial planner with Cornerstone Financial Group in Succasunna. Meckler said the closing costs may also be lower because they won’t have to pay bank fees and appraisal costs. You may also have more flexibility on your down payment, Meckler said. Then there are the potential problems. For starters, you’ll still have to prove you’re a worthy borrower. You’ll still need to make sure the seller owns the house free and clear and that the seller’s lender, if there is one, agrees to the seller financing transaction. You’ll also need to compare the interest rate offered by the seller to those offered by banks. Your seller may offer one that’s higher, or lower. Williams said when dealing with a private mortgage, you’ll need to hire a lawyer. Banks are thorough and sure to record/file everything securely. With an individual, there is a good chance all they’ve thought about is receiving interest payments. She recommends you do a side-by-side comparison. Obtain a quote and list of services to be performed from a bank, then compare the terms and amount of legwork to the private mortgage offering. And finally, be aware that the seller could eventually sell the promissory note. This article by Karin Price Mueller was distributed by the Personal Finance Syndication Network. That age-old question when choosing a place to live of rent versus buy actually raises a series of questions. What can you afford? What makes sense for your situation? Can’t I just live with my parents forever? No matter which aspect plagues you most, it seems there is actually a middle ground. Once you know how much house you can afford (here’s a calculator to help), you might be tempted to investigate rent-to-own options in your range. These arrangements can benefit both the seller and the buyer, but they do not come without risks. If you are thinking of a rent-to-own deal, check out the process, pros and cons below. Rent-to-own arrangements pretty much work like they sound. Instead of applying for a mortgage loan as you do when buying or renting without building any equity in the property, you do a combination of the two. The renter/buyer pays the landlord/seller directly and part of the rent is applied to the principal on the home – eventually adding up to a kind of down payment. The buyer and the seller create a contract that specifies the purchase price of the home, the monthly rental rate and length of the rental term. The seller may also require that the renter/buyer pay property taxes, insurance and any maintenance costs. Once the rental term is over, the renter usually can buy the home for the difference of the amount paid so far in rent from the purchase price previously agreed upon. This can be an option for homebuyers who do not qualify for a traditional mortgage. You don’t need to have great credit or enough cash saved up for a down payment. (You can check your credit scores for free on Credit.com to see where you stand.) In fact, renting to own can give you time to build income and improve your credit history. This arrangement also allows an escape plan in case you decide the neighborhood or home isn’t for you or even if the property value drops drastically over your rental term. Keep in mind, however, that entering into a rent-to-own agreement isn’t as easy to break as a lease and you will most likely lose the equity you’ve been building (more on that below). Sellers benefit because they have an eager renter who will likely take better care of the home than a standard tenant. They also get steady revenue and don’t have to pay closing costs until purchase time. Remember when I mentioned that you can leave if the house isn’t working out? While it seems like a pro, this can also be a con because if you decide not to buy at the conclusion of your rental term, you will likely lose the investment or the “down payment” fund you have created. Most contracts dictate that the seller retains any principal payment you made regardless of whether you go through with the home purchase or not. At the end of the arrangement, you could face the same challenges that held you back from buying in the first place — like a lack of a down payment or bad credit. If you decide to move forward with a rent-to-own agreement, it’s important to read the contract carefully and understand what you are getting into before you sign on the dotted line. You may want to discuss with a real estate attorney or financial adviser before committing to this kind of deal. CHICAGO — As I write this story, I’m stuffing my face with delicious, inexpensive popcorn I purchased from a dollar store. I don’t usually shop at such stores (in fact, I can’t remember the last time I was in one prior to my trip last week), but as a generally frugal person, I found myself curious about the sort of deals I might find there. During the recession, sales soared at the three major dollar stores (Dollar General, Dollar Tree and the Family Dollar — the latter two companies announced a merger early in 2015). Even as the country moved out of recession, these discount retailers continued to grow, opening new stores, expanding product lines and maintaining sales increases that show dollar store shoppers aren’t going anywhere. Part of the sustained appeal is the increasing availability of name-brand merchandise, as opposed to the generic products usually associated with discount retailers. 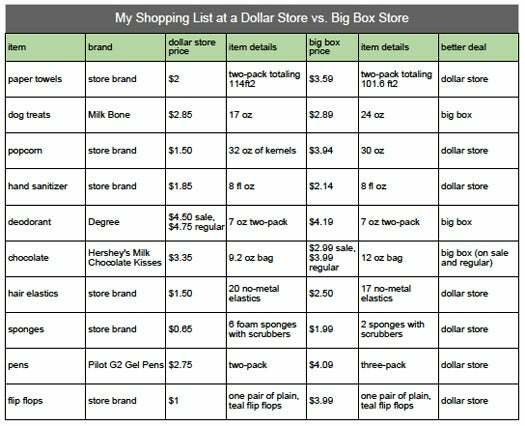 I wanted to see if it made more financial sense to run errands at a dollar store or go to a big-box store (like Walmart or Target). I went to a neighborhood where, if I lived there, I could easily walk to either a dollar store or big-box retailer, so it was really a choice of which place would serve my budgetary needs best. I went to both stores on the same day — first to the dollar store — to see if I saved money by choosing the dollar store or if I would have fared better by shopping at the larger chain. It was a decision anyone living in that neighborhood might make on a weekly basis. I didn’t do any price comparison with ads or on my phone; I went on my instinct of what I thought was a good deal, and in the moment, I really thought everything I bought was cheaper than what I’d find at the other store. If I bought a generic brand at the dollar store, I compared it to the big-box generic version. I compared name brands to the same brand at the other store. Yes, dollar stores have a lot of low-cost stuff, and I was surprised how many name-brand items were available. That being said, price comparison wasn’t the easiest thing, because nearly every name-brand item I bought was sold at a different size at the dollar store than it was at the big-box retailer. Oftentimes, a price that seemed like a good deal actually wasn’t, once you calculate the price-per-unit or price-per-ounce. I didn’t buy several things (because I didn’t need them) that would have been good deals, like plastic cutlery, dish soap and picture frames. If I’m ever throwing a party and I want disposable dishes or serving trays, I got the sense that the dollar store would be the place to go. The sponges I got at the dollar store weren’t the same size as the ones at the big box store, but that didn’t really make a difference. I don’t have a dishwasher, and I used one of the dollar store sponges to do dishes for a week, and it was fine. The scrubby part started to detach from the spongy part faster than with other sponges I’ve used, but it wasn’t falling apart to the point of throwing it out or leaving debris in my sink. They were cheaper but weren’t as stretchy as the ones I normally get. The first one I pulled out of the pack broke immediately. Still, I used the dollar store hair ties to hold my (long, thick) hair back during multiple runs, swims and bike rides throughout the week. They felt lower quality to the touch, but I couldn’t tell the difference when they were in my hair. I wore these around my apartment building and neighborhood when taking out the trash, walking the dog or doing laundry. They’re flimsy, but comfy. As far as cheap, throwaway flip-flops go, these are definitely worth a dollar. I make my popcorn on the stove and season it myself, and I didn’t notice any more or fewer unpopped kernels than I normally get with other store-brand kernels. All of the food I bought was well within whatever “best by” date the package showed. I’ve always thought generic paper towels are not as strong or as absorbent as brand-name paper towels, and these were no different. If you’re going to buy generic anyway, these were good enough and worth the savings. I feel no more or less germy than usual. My entire trip to the dollar store cost $23.54, which felt good for the amount of stuff I purchased. Cutting everyday costs is often crucial to staying on budget and out of debt, so I’d encourage anyone who’s really pinching pennies to explore what their local dollar store has to offer. At the same time, it’s important to consider the selection differences among stores, compare prices ahead of time or know what quantity you usually buy things in. Despite the fact that I have a constant supply of Hershey’s Kisses in my apartment (seriously), I didn’t realize that a 9-oz. bag wasn’t what I normally buy, and I mistakenly thought I was getting a deal when I wasn’t. Smart shopping goes a long way in keeping your finances on track, so it’s worth it to pay attention to details. It’s been a while since I worked in a job that would be considered “low-wage,” but that doesn’t mean I don’t remember what the low-wage lifestyle was like. Quite the contrary, really. I actually remember exactly what it felt like to be broke until payday, struggling to come up with money for anything extra – like birthdays, clothes, and even shampoo or conditioner. I also remember being really embarrassed from time to time, like the time my sister invited me to Applebee’s and I didn’t even have $10 to pay for dinner and a tip. I’m not sure she believed me when I said that I didn’t have the money, and that almost made it worse. When you have a regular job and earn and nice living, it can be difficult to understand how anyone could have less than $10 in their account. Relationships almost always come with their fair share of disputes, but fighting about money can be another animal entirely. Managing joint finances is rarely easy, but keeping the lines of communication open can go a long way. Take a look at the most common money fights couples have and consider which strategies can help you avoid repeating the same arguments. Whether it’s student loans, credit cards or costly car and mortgage payments, debt can make joint financial issues even more complicated. Perhaps one person came into the relationship with more debt or one of you is more committed to paying off that debt (and willing to live more frugally to do it). Whatever the situation, it’s important to add up the true cost of your debts, how much you are currently putting toward repayment each month and calculate how much you can save in interest by accelerating payments. You can also see how that debt is affecting your credit by getting your free credit report summary on Credit.com. In fact, reviewing your credit reports is also a worthwhile activity to do together as a couple. Ideally, you would work on your finances together in perfect harmony. This may be challenging, and it can be more convenient to make one person the point person for finances, or to at least organize the finances. It’s just important to make sure that person doesn’t have so much control that they feel overwhelmed or the other person feels like they are excluded. To alleviate that problem, schedule regular meetings to ensure bills are kept in check and both of you are on the same page. Couples that once operated as individuals can have trouble creating boundaries when it comes to spending. It’s a good idea to sit down and discuss a budget you are both comfortable with, and then check in each month to make sure you are both following it. One way to do this to create a personal allowance for both of you. This isn’t about putting you or your partner on a financial leash, but about coming to terms with how you can realistically spend and manage money together. Everyone has different priorities even if you share your feelings and your life – whether saving for retirement, having life insurance, saving for children’s education or enjoying life to the fullest. If one of you tends to be more the “spender” and one the “saver,” try to understand those distinct relationships with money and acknowledge how your own attitudes can cause issues in the relationship. Plan together to find a balance and set goals to spend, save and invest. Try to find a compromise that doesn’t force either side to sacrifice whichever goals are the most important. Being honest about merging finances is incredibly important. Anytime someone is dishonest, there will surely be trouble as it signals problems in your bank account and possibly even in the relationship. No matter how ashamed you may be about your financial past or present, keeping money secrets usually only make it worse. Talking it out may seem scary, but it can give your partner more insight into where your money values are coming from. Hopefully this is not the case for you, but sometimes financial arguments are at the head of a deeper problem. If someone is a compulsive spender, has a gambling addiction or shares too generously, you may need to seek out professional help. Money is a sensitive topic for most of us and while there is no distinct right and wrong when it comes to finances, it’s a good idea to regularly discuss them with your significant other to avoid fights down the road.